Chris James and Steve James look at the latest developments in innovative freezing technologies. Freezing is a well established food preservation process that produces high quality nutritious foods that offer the advantage of a long storage life. However, freezing is not suitable for all foods, and freezing does cause physical and chemical changes in many foods that are perceived as reducing the quality of the thawed material. There is a general view that fast freezing, and the formation of small ice crystals, offers some quality advantages. However, this is not true of all foods, for example while freezing rate may affect drip in meat there is no evidence that it has any substantial influence on its final eating quality. Nether-the-less many innovative freezing processes are currently being researched and developed throughout the world to improve freezing times and product quality. 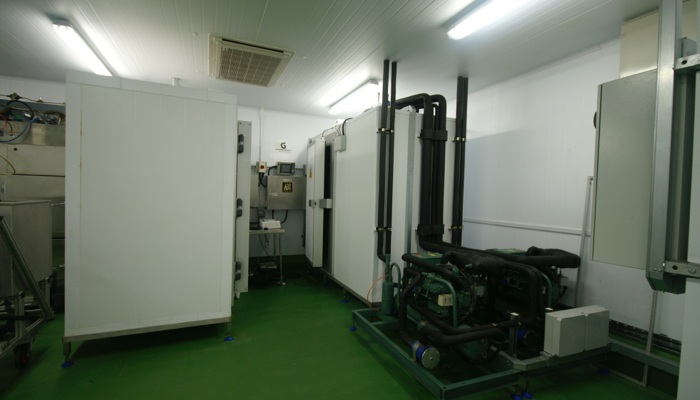 Some innovative freezing processes (impingement and hydro-fluidisation) are essentially improvements of existing methods (air blast and immersion, respectively) that by providing far higher surface heat transfer rates than previous systems aim to improve product quality through rapid freezing. In these cases, the advantages may depend on the size of the product, since the poor thermal conductivity of many foods limits the rate of cooling in large objects rather than the heat transfer between the cooling medium and the product. Other processes (pressure shift, magnetic resonance, electrostatic, microwave, radio frequency, and ultrasound) are adjuncts to existing freeing systems (such as air blast, immersion, cryogenic etc) that aim to improve product quality through controlling the way that ice is formed in the food during freezing. An alternative is to change the properties of the food itself to control how ice is formed during freezing (such as in dehydrofreezing and the use of antifreeze and ice-nucleation proteins). Many innovative technologies being researched and developed currently promise improvements in the quality of frozen foods. Some of these innovative technologies are in the development stage, while for others the biggest obstacle is high capital cost. It is also not clear how well small ice crystal structures are maintained during subsequent storage, as ice crystals over time will agglomerate, the phenomenon know as Ostwald ripening. Some of these technologies potentially offer energy savings, primarily through reducing the freezing time. Others may offer quality advantages at the cost of greater energy or cost. In such cases it remains to be established how important quality versus cost is to the consumer. More details about these technologies can be found in our article on “Innovative freezing technologies for foods” in the 2012 issue 4 of “New Food” magazine.